Kooltronic has expanded its line of filter fans to include models offering the security of NEMA 4 or 4X Ratings together with the versatility of indoor or outdoor use. All Guardian Series Filter Fans have a NEMA 4 Rating. The GuardianX Series Filter Fans, with a NEMA 4X Rating, are offered with a Stainless Steel Shell. The GuardianX Series Indoor/Outdoor Filter Fans are a perfect choice for dissipating high heat loads economically. 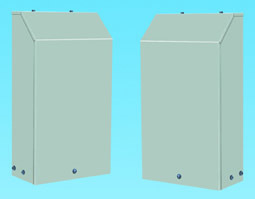 Two models are available, with airflows from 90 to 290 CFM (fan airflow without filter). The new GuardianX Series Indoor/Outdoor Filter Fans offer the same convenience, versatility and reliability as the Advantage Series Filter Fans with the added protection of a NEMA 4 or 4X Rating, making these models an excellent choice for washdown, telecommunications and the food service industry.